Many of the immune activating abilities of lipopolysaccharide can be attributed to the lipid A unit. Lipid A is a lipid component of an endotoxin held responsible for toxicity of Gram-negative bacteria. The synthesis of unsaturated fatty acids involves a desaturation reaction, whereby a double bond is introduced into the fatty acyl chain. In archaea, the mevalonate pathway produces reactive precursors isopentenyl pyrophosphate and dimethylallyl pyrophosphate from acetyl-CoA, while in plants and bacteria the non-mevalonate pathway uses pyruvate and glyceraldehyde 3-phosphate as substrates. lipid A: Lipid A is a lipid component of an endotoxin held responsible for toxicity of Gram-negative bacteria. 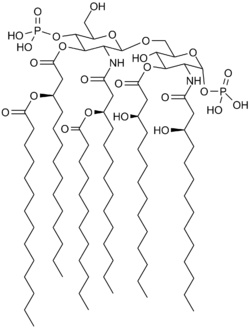 It is the innermost of the three regions of the lipopolysaccharide (LPS, also called endotoxin) molecule, and its hydrophobic nature allows it to anchor the LPS to the outer membrane. endotoxin: Any toxin secreted by a microorganism and released into the surrounding environment only when it dies. lipogenesis: The biochemical production of fat, especially the conversion of carbohydrate into fat so that it may be stored as a long-term source of energy when food is scarce. Lipids constitute a broad group of naturally occurring molecules that include fats, waxes, sterols, fat-soluble vitamins (such as vitamins A, D, E, and K), monoglycerides, diglycerides, triglycerides, phospholipids, and others. The main biological functions of lipids include energy storage, as structural components of cell membranes, and as important signaling molecules. Lipids may be broadly defined as hydrophobic or amphiphilic small molecules. The amphiphilic nature of some lipids allows them to form structures such as vesicles, liposomes, or membranes in an aqueous environment. Biological lipids originate entirely or in part from two distinct types of biochemical subunits or “building-blocks”: ketoacyl and isoprene groups. Using this approach, lipids may be divided into eight categories: fatty acids, glycerolipids, glycerophospholipids, sphingolipids, saccharolipids, and polyketides (derived from condensation of ketoacyl subunits); and sterol lipids and prenol lipids (derived from condensation of isoprene subunits). Synthesis of the UDP-diacylglucosamine precursor of Lipid A: Synthesis of the UDP-diacylglucosamine precursor of Lipid AThe synthesis of unsaturated fatty acids involves a desaturation reaction, whereby a double bond is introduced into the fatty acyl chain. For example, in humans, the desaturation of stearic acid by stearoyl-CoA desaturase-1 produces oleic acid. The doubly unsaturated fatty acid linoleic acid as well as the triply unsaturated α-linolenic acid cannot be synthesized in mammalian tissues, and are therefore essential fatty acids and must be obtained from the diet. Triglyceride synthesis takes place in the endoplasmic reticulum by metabolic pathways in which acyl groups in fatty acyl-CoAs are transferred to the hydroxyl groups of glycerol-3-phosphate and diacylglycerol. Terpenes and isoprenoids, including the carotenoids, are made by the assembly and modification of isoprene units donated from the reactive precursors isopentenyl pyrophosphate and dimethylallyl pyrophosphate. These precursors can be made in different ways. In archaea, the mevalonate pathway produces these compounds from acetyl-CoA, while in plants and bacteria the non-mevalonate pathway uses pyruvate and glyceraldehyde 3-phosphate as substrates. Although humans and other mammals use various biosynthetic pathways to both break down and synthesize lipids, some essential lipids cannot be made this way and must be obtained from the diet. In animals, when there is an oversupply of dietary carbohydrate, the excess carbohydrate is converted to triglycerides. This involves the synthesis of fatty acids from acetyl-CoA and the esterification of fatty acids in the production of triglycerides, a process called lipogenesis. Fatty acids are made by fatty acid synthases that polymerize and then reduce acetyl-CoA units. The acyl chains in the fatty acids are extended by a cycle of reactions that add the acetyl group, reduce it to an alcohol, dehydrate it to an alkene group and then reduce it again to an alkane group. The enzymes of fatty acid biosynthesis are divided into two groups, in animals and fungi all these fatty acid synthase reactions are carried out by a single multifunctional protein, while in plant plastids and bacteria separate enzymes perform each step in the pathway. The fatty acids may be subsequently converted to triglycerides that are packaged in lipoproteins and secreted from the liver. One important reaction that uses these activated isoprene donors is steroid biosynthesis. Here, the isoprene units are joined together to make squalene and then folded up and formed into a set of rings to make lanosterol. Lanosterol can then be converted into other steroids such as cholesterol and ergosterol.